Nemesis was the goddess of indignation against, and retribution for, evil deeds and undeserved good fortune. She was a personification of the resentment aroused in men by those who commited crimes with apparent impunity, or who had inordinate good fortune. Nemesis directed human affairs in such a way as to maintain equilibrium. Her name means she who distributes or deals out. Happiness and unhappiness were measured out by her, care being taken that happiness was not too frequent or too excessive. If this happened, Nemesis could bring about losses and suffering. As one who checked extravagant favours byTykhe (Fortune), Nemesis was regarded as an avenging or punishing divinity. In myth Nemesis was particularly concerned with matters of love. She appears as an avenging agent in the stories of Narkissos and Nikaia, whose callous actions brought about the death of their wooers. In some versions of the Trojan War, she was the mother of Helene, and is shown in scenes of her seduction by Paris pointing an accusing finger at the girl. 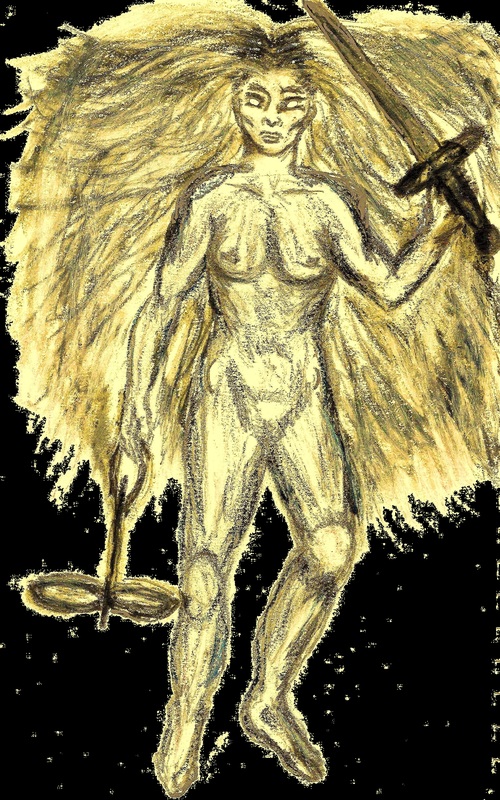 Nemesis was often sometimes depicted as a winged goddess. Her attributes were apple-branch, rein, lash, sword, or balance. Her name was derived from the Greek wordsnemêsis and nemô, meaning “dispenser of dues.” The Romans usually used the Greek name of the goddess, but sometimes also called her Invidia (Jealousy) and Rivalitas (Jealous Rivalry). Nemesis was the goddess of righteous indignation who punished boasts of hubris. “Would that I were not among the men of the fifth age, but either had died before or been born afterwards. For now truly is a race of iron, and men never rest from labour (kamatos) and sorrow (oizys) by day, and from perishing by night; and the gods shall lay sore trouble upon them. But, notwithstanding, even these shall have some good mingled with their evils. And Zeus will destroy this race of mortal men also when they come to have grey hair on the temples at their birth. The father will not agree with his children, nor the children with their father, nor guest with his host, nor comrade with comrade; nor will brother be dear to brother as aforetime. Men will dishonour their parents as they grow quickly old, and will carp at them, chiding them with bitter words, hard-hearted they, not knowing the fear of the gods. They will not repay their aged parents the cost their nurture, for might shall be their right: and one man will sack another’s city. There will be no favour (kharis) for the man who keeps his oath or for the just (dikaios) or for the good (agathos); but rather men will praise the evil-doer (kakos) and his violent dealing (hybris). Strength will be right (dike) and reverence (aidos) will cease to be; and the wicked will hurt the worthy man, speaking false words against him, and will swear an oath upon them. Envy (zelos), foul-mouthed, delighting in evil, with scowling face, will go along with wretched men one and all. moving but leaving no trace, the fortune of man turns. you scrutinize the thoughts of men, you always hold the balance. Be merciful, hallowed judge, winged Nemesis, life’s force. who alone judges the deeds of mortals. men groan beneath the weight of Your righteous chains. unwilling to obey reason, is judged by You. Yours is the power to see and hear and rule. and take these mystics under Your protection. dire and hostile impious counsels, arrogant and base. And abundant strength lend to our powers of reason. ~ by meanderingsofthemuse on July 7, 2012.